Ten-man Hemel Hempstead Town blew the chance to gain ground on their Conference South playoff rivals as they were thumped 3-0 at home by Bath City. Bath took the lead in first half stoppage time through the impressive Frankie Artus, before Hemel’s David King was shown a straight red card for a petulant headbutt on Bath’s Ashley Kington. There was no way back from there for Hemel, and Bath wrapped up the win late on with goals from Ross Stearn and Dave Pratt. 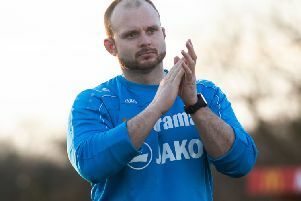 In a game filled with drama, it was Bath who came closest to breaking the deadlock in the early stages when Hemel goalkeeper Laurie Walker dawdled on the ball and his kick was charged down by Pratt. The ball cannoned off the Bath striker and looked destined to fly into the unguarded net, but the drying pitch came to Hemel’s rescue as the ball bounced up off the ground and dropped narrowly over the crossbar. Soon afterwards it was the referee’s assistant who stole the limelight as he was forced off injured with a strained calf muscle. The game was halted for around 10 minutes while a new linesman was found – and bizarrely, he emerged via the press box in the form of a BBC reporter. There was little action of note for the remainder of the half as both sides elected to kick the ball long on the bobbly pitch, but the game sprung into life in the fifth of 11 minutes of added time at the end of the first period. A throw-in from Hemel was launched towards centre-forward Hawkins inside his own half, and the stand-in linesman looked to have flagged for an offence, but he was overruled by the referee. The Hemel players were caught cold as they waited for the whistle to blow for the foul, but Bath continued to play and were rewarded with the opening goal when Artus expertly drilled the ball past Walker into the corner of the net from 18 yards. The Tudors clearly felt a sense of injustice at being behind, and they were left cursing their luck once again at the start of the second half. With only a couple of minutes on the clock, it seemed certain that Zane Banton was set to level the scores with a deft flick, but his effort came back off the post. Hawkins retained possession and fired the ball across the area, where it was cleared as far as Jordan Parkes who curled an effort towards goal – with the ball hitting the opposite post and again bouncing away to safety. Hawkins had a goalbound shot blocked soon afterwards, but a moment of madness from King effectively ended the game as a contest. The right-back won a free-kick on the touchline for a tangle with Kington, but it was King who saw red as he headbutted the Bath man right in front of the referee. Tudors boss Dean Brennan responded with a triple substitution, bringing on Nicke Kabamba, Kyle Connolly and James Potton as he tried to find a way back into the game, but it was always going to be a difficult task against a well-drilled Bath side. Hemel huffed and puffed, but it was the visitors who wrapped up the win late on when first Stearn made amends for a one-on-one miss with a fierce strike past Walker, before Pratt made it three with a crisp strike into the far corner. The only consolation for Hemel on an otherwise miserable day was that playoff rivals Gosport Borough and Havant & Waterlooville also lost – meaning the Tudors remain seventh place in the table, six points off fifth spot but with a game in hand on the sides directly above them.